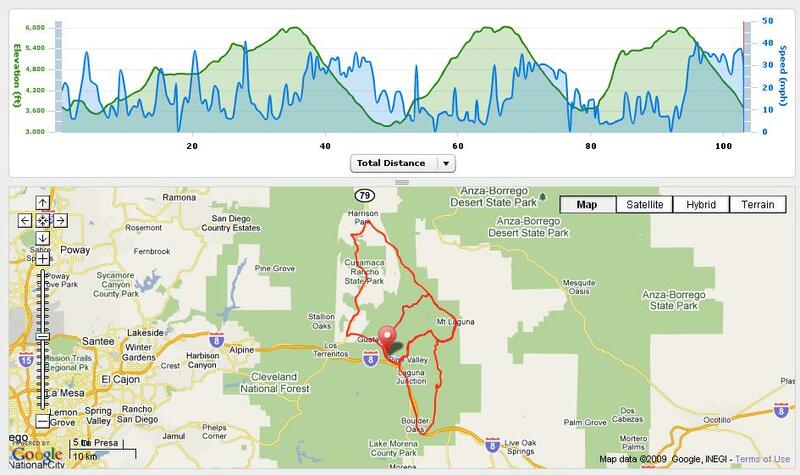 Wow what a fantastic day Brandy and I had on yesterday’s Mount Laguna Bicycle Classic Pre-Ride. 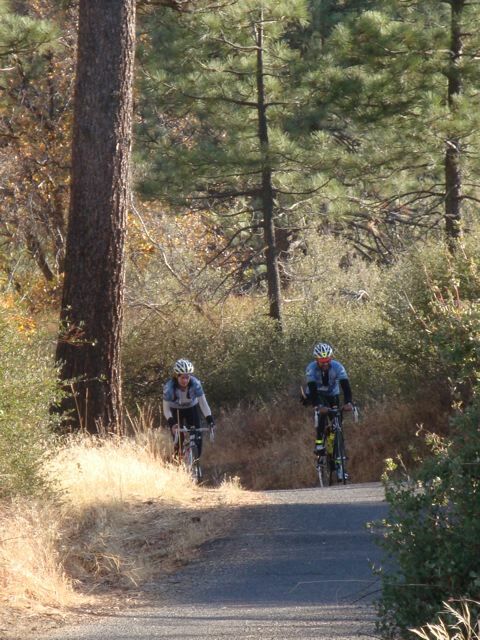 The 2010 Mount Laguna Bicycle Classic is the newest AdventureCORPS cycling event, featuring 103 miles with 10,000 feet of climbing and three different ascents of San Diego County’s Mount Laguna! We’ll climb San Diego’s highest point via Sunrise Hwy from the north, via the fabled and car-free Kitchen Creek from the south-east, and via the little-known and truly epic Pine Creek drainage from the west. There are just three stop signs and NO traffic lights on this incredible route which starts and finishes in Pine Valley, CA! This is a tough climbing century– the way they all should be. The weather in the mountains, in November, takes special planning. We were blessed with fantastic weather. We had clear skies, and barely any wind. Sure it was cold (low of 35F at the start) but it was to be expected. We dressed in many layers consisting primarily of wool and then synthetics for our wind shells. The weather in April will be warmer than what we had to contend with yesterday but you should plan accordingly — it is the mountains after all. Here is a link to yesterday’s weather in Pine Valley. Pine Valley County Park is located at 3736 feet elevation. 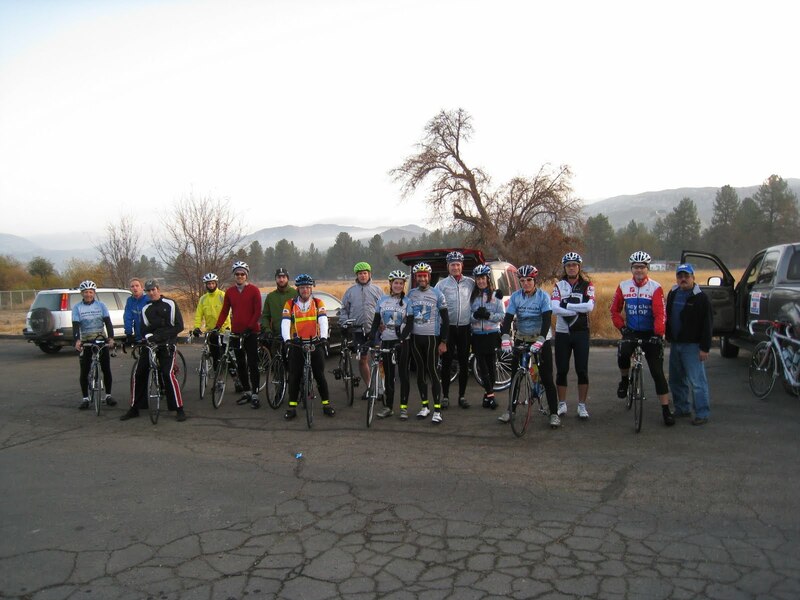 Loop One is a clockwise route from Pine Valley to Guatay, north on 79, around Lake Cuyamaca, and south on Sunrise Hwy over Mt. Laguna. (It does not quite return to Pine Valley.) Distance: 43.4 miles; Elevation Gain: 3770 feet. Click here for detailed maps and graphs of each loop. A short descent from the Pine Valley start, a short climb to Guatay and then another quick descent. We then climbed for next 30 miles. Lots of up and down as we gradually made the ascent from 3600 feet to 6000 feet. The views were spectacular throughout the ride. In particular, I’ve always enjoyed going around Lake Cuyamaca and seeing the meadow off to the right with the mountains as a backdrop. Race Director Chris Kostman promises an even better view in the spring with flowers in the meadow. A note of caution– the road to Lake Cuyamaca is narrow. It does widen later but there is a short stretch where you must stay as far to the right as possible. We had little traffic, considering it was before 7am. Riders should expect a few kickers here and there that ramp up over 8% just to keep things interesting. There was also a few switchbacks as well. There was also a few switchbacks as well. The Race Director knowingly made this the first loop anticipating higher traffic in the spring. The ascent on Mount Laguna from the north heading south is my favorite and most scenic way to climb up and over the Mount Laguna summit of 6000 feet on Sunrise Hwy. The traffic is significantly less from this direction than coming from the south where there is freeway access (Interstate 8). Here are a great couple of shots taken of us going around the lake. Next we had a long descent down Sunrise Hwy towards Old Hwy 80. The descent on Sunrise Hwy is long because you never really get up to high speeds and it requires a little work to keep the speed above 30 mph. I have been climbing so much in the San Gabriel Mountains that I had forgotten that the San Diego mountains have cattle guards. Here’s a tip for you– most of the cattle guards have a straight strip welded perpendicular to the others. When I cross cattle guards I line myself up on that strip which is just wide enough for a bike tire. In addition, I have a very loose grip on the handlebars. The combination of those two things makes for almost no shock at all as I cross cattle guards. You will master this technique as you descend Sunrise Hwy on three separate occasions. We continued to descend past the right turn for Pine Valley across I-8 and onto Old Hwy 80. The shoulder on Old Hwy 80 is a little tore up so be careful. You can easily attain 40mph on some of these sections. We passed a Border Patrol checkpoint along the way– wave as you go by it must be boring work. TIP: If you need something from your car this would be the time to detour from the route and get it. It will be a couple of hours before you return. Loop Two, depicted in the following three images, is a counter-clockwise route from Sunrise Hwy east on Old Hwy 80, north on Kitchen Creek (which is closed to cars for 3.7 miles in the middle), north on Sunrise Hwy to the Mt. Laguna summit, then south on Sunrise Hwy and back to Pine Valley. Distance: 33.6 miles; Elevation Gain: 3300 feet. At the base of Kitchen Creek we were treated to an awesome SAG stop by Adobo Velo. These guys do it right! Ricky and Mandy had been roving SAG during the day. At the base of Kitchen Creek, they set-up a table with water, Hammer products and even hand sanitizer. Also on the menu: figs, nacho chips, bananas, PB & J and so on. THANK YOU ADOBO VELO!! If you don’t know the Kitchen Creek climb it’s a remote climb with a closed gated section to motor vehicles. It is a great climb with a few steep rollers before reaching the heart of it. Here is a shot of me teasing Brandy that I could push her if she wanted. No actually I’m just giving her props for doing well. We climbed and climbed until we made the junction with Sunrise Hwy. A right turn and we finished the climb up to the Visitor’s Center again. We reached the Visitor’s Center at 1250. Kitchen Creek is by far one of my favorite climbs in all San Diego County. I love the closed gated section. It makes it so much safer and peaceful. If you haven’t been on this climb before then just being able to discover this climb might make the event worth it for you. As mentioned before this is a remote climb and usually there isn’t any where to get provisions. So having the support and knowing other riders will be coming your way will put you at ease when doing this climb during the event. I noticed on the event website that the Race Director recommends you bring flat repair AND a complete tire. It is great advice to heed. Second summit on Mount Laguna approx 65 miles and 7200 feet of gain. We descended Sunrise Hwy back to Pine Valley and restocked before beginning the third and final loop. I can’t believe out of all the times I rode to and from Pine Valley that had I never made the turn onto Pine Creek Rd. The third loop is the shortest but the toughest of the three. I like the fact that it comes last in the event as a way to really test your resolve! 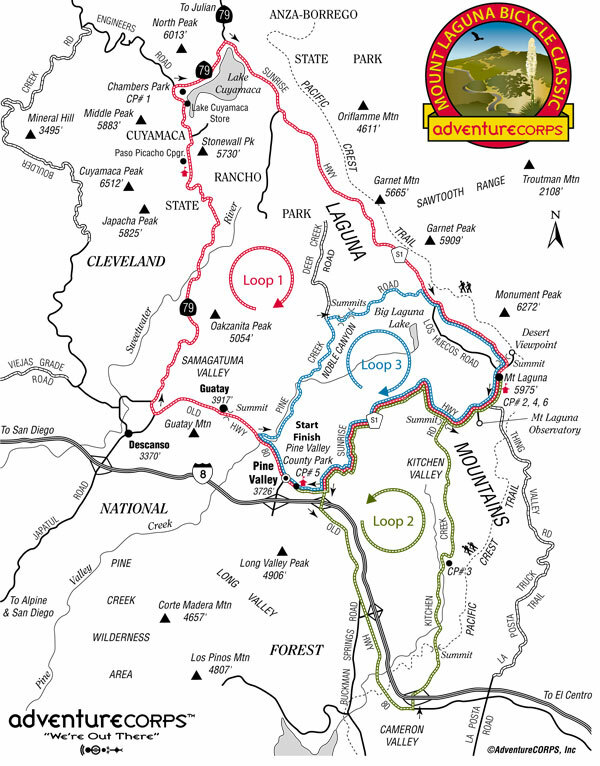 Loop Three, depicted in the following three images, is a clockwise route from Pine Valley, west on Old Hwy 80, then up the one-of-a-kind Pine Creek Road (as featured in the event logo) all the way to Sunrise Hwy, then south over Mt. Laguna and back to Pine Valley. Distance: 25.7 miles; Elevation Gain: 2820 feet (2000 feet of which is gained in the 10.2 miles on Pine Creek Road). Notice the sharp ramp up beginning on Mile 4. There are significant pitches of over 18%. Be assured this will be the climb that separates the “pretenders from the contenders” as they say. I would strongly suggest compact gearing. What is COMPACT GEARING you ask? Cranksets typically come in “standard” set up of 53/39. In other words, your big chainring is 53 teeth and your inner or small chainring is 39 teeth. A compact crankset has typically a 50/34 for chainrings. It allows for easier climbing in your 34 front chainring and whatever large cog you can muster for the back. Don’t be ashamed to use a triple chainring on this course either. By the way, the term compact does not have any relation with crank arm length just the chainrings. Brandy and I had to really work on keeping the pedals turning. I had a standard 53/39 and 12/27 cassette. I consider myself a good steep grade climber. By that I mean, that when the road really pitches up I can ascend them better than the next guy or gal. On long climbs of 6% grades I don’t fair as well. Brandy had a compact crankset and a 12/27 cassette. She really suffered on the Pine Creek Rd. Let’s set aside the difficulty of the climb for a moment and focus on why we climb mountains. The views from Pine Creek Rd. are simply amazing. It’s so incredible to see nature’s beauty. It was on this climb that I spent a few minutes talking to John Marino. It was an honor just to be in his presence. I related to him that I was born and raised in New Jersey. I was a city kid. And even though I have lived in Southern California for 10 plus years nature still amazes me. As a group we stopped several times on the climb to take pictures and regroup. We also took time to enjoy the scenery. I’m always in race mode and never “take time to smell the flowers” as they say. But being with a good group of friends made me realize that it was a unique opportunity to take advantage of. Except for a few cars the road was ours. The climbing is slow because of the steep grades (expect 4-5mph) but that’s a good thing– it gives you more time and opportunity to enjoy the solitude and the scenery. Just look at the photo below — just awesome. Climbing one of the steep grades on Pine Creek Rd. Nearing the summit and getting into the tree line. A note of caution– after all the steep stuff you have a couple or more really steep dips. The road is single lane– make sure you are looking up ahead as you drop in and out of these dips. You may surprise a motorist not expecting a cyclist to be on Pine Creek Rd. The Race Director will provide Caution Bicycle Event signs that will alert drivers to expect cyclists on the road. But who knows the motorist might be in awe with the scenery as well 😉 There is also sand on some of the corners. So be careful. Once we made the junction with Sunrise Hwy we climbed up to the Visitor’s Center one last time. It was 9 hours and 25 minutes into the event almost 4pm. The only thing left was the third and final descent on Sunrise Hwy to Pine Valley. We arrived at Pine Valley, the start/finish point, at 4:20pm. Just shy of 10 hours on a hard climbing century with plenty of regrouping and picture taking. The event will have a 12 hour limit. It is more than doable!! Once at the finish Adobo Velo pulled out all the stops. They had set up a HOT MEAL! Can you believe that? There was Chicken Adobo and a Vegetarian Stew complete with bread and all the other things we had during the day. It was a cold descent from the summit of Mount Laguna but the hot food at the finish helped me forget about my discomfort. Thank you again Adobo Velo. 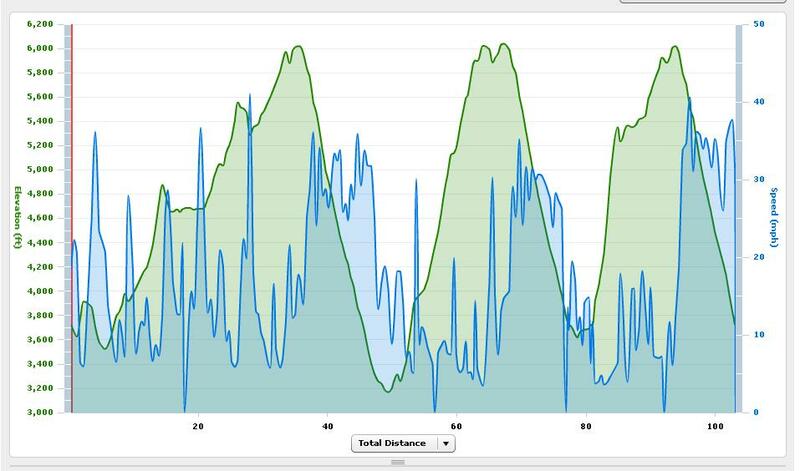 Additonal graphs from my friend’s Garmin. It calculated 11,700 feet of gain. Here’s the great thing about this ride if you are unsure whether you can complete the whole century you can pre-ride portions of it. Your strategy may be to work on your endurance by doing the different loops on different days. All the graphs and maps of the route are available online for you to plan your ride. Try one loop or two and maybe the whole enchilada before April 17th. I would strongly suggest doing a pre-ride of Loop 3 so Pine Creek doesn’t catch you by surprise. Your gearing selection will greatly improve your success on the most difficult climb of this event. 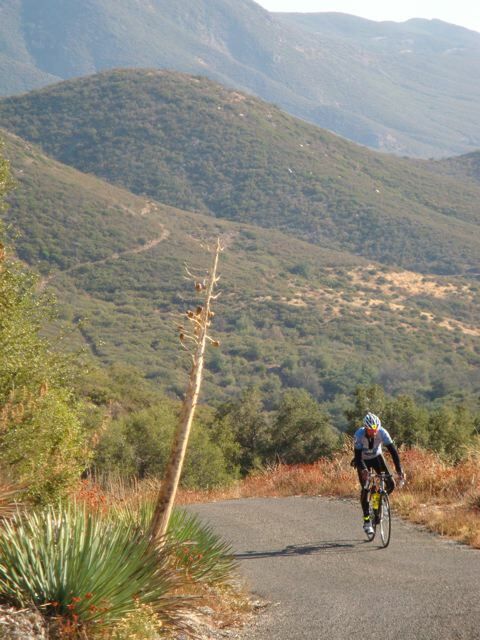 The Mount Laguna Bicycle Classic is going to be a great addition to the century options already offered in San Diego. It will appeal more to the rider looking for a challenge and likes to climb. One other great thing about this ride is that the traffic is significantly lower than any of the organized centuries or doubles I have done in Southern California. It will be a timed a event but not a race. If you belong to a club AdventureCorps will recognize the top three co-ed members of your club with the best times. It is a fantastic event with little known and scarcely traveled roads. There is a rider limit of ONLY 300! Sign up today! 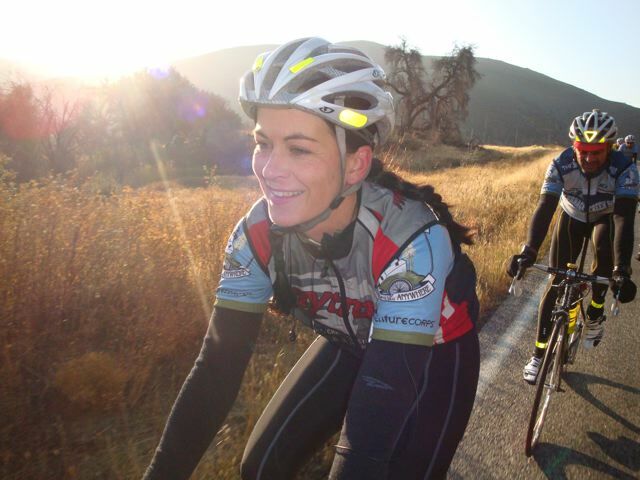 This entry was posted in AdventureCorps, century routes by REV Cycling Directeur Sportif. Bookmark the permalink.